Regardless of whether you plan your wedding for outside, on a beach, in a castle, in a church, a dining hall, it will need to be decorated according to the wedding theme and colors. Even if you don't have a specific theme, the place should be decorated to declare that this is a joyous, special event. It could involve chair covers, arches of balloons, different shades of lighting or colorful lanterns, the style of tablecloths. Even the most minimalistic of weddings will involve some elegant decorations. Lighting and decor are the creators of the atmosphere and ambience of your special day. Creating this is a work of art in itself but doesn’t necessarily involve a lot of money. 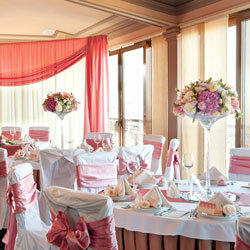 Guests enjoy the wedding decorations and they are a way of imprinting your own personalities and style on the event. From tealights to helium balloons, silver coasters to painted Mason jars, wedding decorations are the details which celebrate and share your love in a clear artistic way. Every wedding requires decoration, regardless of its theme and location. The decoration declares: ‘This day is important and wonderful! Celebrate!’ With imagination and flair, the most barren of settings can turn into a warm and festive place to host your wedding.